Jewish Humor Central: Muppets Search for Afikoman in Les Matzarables "Matzah in the House"
Muppets Search for Afikoman in Les Matzarables "Matzah in the House"
What could a bunch of muppets searching for a missing afikoman have in common with a cunning and comical innkeeper and his wife in France in the early 1800s? Well, thanks to the impression that the Broadway musical Les Miserables had on the writers of Shalom Sesame, what they have in common is the music of a song, or maybe most of its notes. 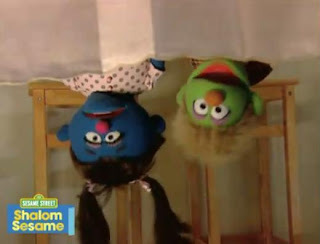 Just in time for Passover, Shalom Sesame, a version of Sesame Street aimed at introducing children to Jewish life and Israel, has posted a video of muppet characters looking all over for a missing afikoman while singing Matzah in the House, an adaptation of the Les Mis song Master of the House. If you don't remember the Broadway original, or if you do and would like to hear it again, here's a link to Master of the House as sung at the tenth anniversary of the show. Enjoy both versions!